By testing in a load cell constructed specifically for fastener testing, the relationship between input torque and induced tension can be determined, and from this data the Nut Factor (also sometimes referred to as K factor) or coefficient of friction (μ or COF) can be calculated. This test is commonly used to evaluate the effect of alternative fastener finishes, lubricants or to test the impact of re-sourcing fasteners. By controlling bearing materials, this test is also used as a substitute for in-joint torque-tension testing where fastener access, joint configuration or part availability prevent use of ultrasonics. A quick internet search will yield K factors and coefficients of friction for many common fastener finishes, but don’t be misled! Each of these can vary significantly and are best derived through testing. The team at Peak are experts at the torque-tension testing techniques required to derive these values, including the ISO 16047 test specification. Need K factor, nut factor, or coefficient of friction data? Don’t guess, give the experts at Peak a call for torque-tension testing! High capacity sensors shown – Torque and tension measurement as low as 2 in-lb and 1.5 kN (338 lb) can be measured with alternative sensors. 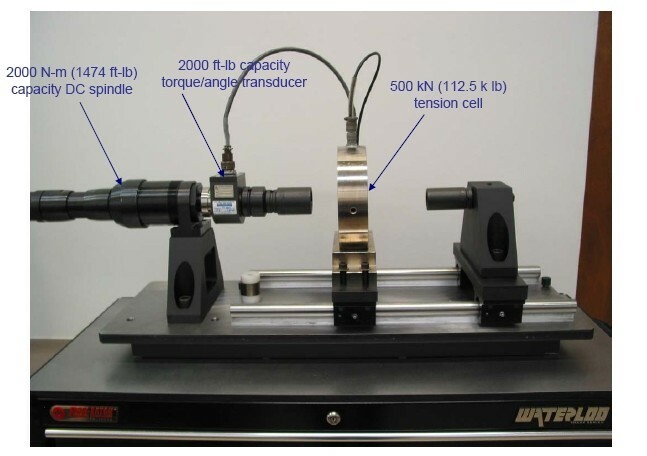 Looking for in-joint torque-tension testing instead? Take a look at our ultrasonic testing capabilities.